I can’t remember whether I opened it before going to sleep or after waking up but the card Yoli and Ben had made for me which read “Open at 1st drop bag” made me laugh so much I nearly wet myself. It was a real boost to the spirits. I’ve mentioned it before on this blog but I love riding at night – still, cool air, quiet roads and peaceful riding. It’s a big advantage on any long Audax ride but particularly this one when, an hour ago, multiple alarms went off all around my room. Some of these were placed intentionally out of reach so I couldn’t just roll over and mute them. The various ringing bells dragged me up from possibly the deepest sleep I’ve ever experienced mid-ride. I was so dead to the world it took me a couple of minutes to properly come too and even remember where I was. Before heading to the shower I sent Peter a quick message – there was still about 3.5 hours in hand over the control cut-off, meaning he could still use the hotel room if he was nearby. As the powerful downpour from a hot shower restored me I patted myself on the back once again for planning ahead and booking this hotel last September. It seemed ridiculously early at the time, but I know they were fully booked not long after. I faffed around quite a lot getting ready. Fresh contact lenses went in, Sudocreme was liberally applied to the undercarriage, and on went fresh clean kit – thermal vest for the cold night, and William’s old-style jersey on top which had a fairly generous cut. The new-style slim cut jersey went in the saddle pack to wear later when it warmed up. Body all sorted, I started on the bike – swapping out the front light battery pack, leaving the used one in the hotel room on charge. As a precaution I put fresh AAAs in the rear light I’d been using – they should have plenty left, but it save me needing to think about changing them en-route. Finally I reset the Garmin and loaded up the track for the next leg. Just before heading out I checked my messages but nothing from Peter – I messaged again saying I was leaving but would keep an eye out for him on the road. It was a great feeling rolling past the control around midnight with 2.5 hours in the bank – it was unpleasantly cold though, and I cursed leaving my leg warmers back in Paris. As I wound through the town my mind went over the day ahead and started to form a plan. 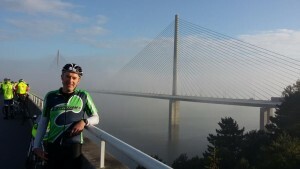 It was just short of 350km out to Brest and back to Loudeac – a welcome relief to have 100km less riding than yesterday. I resolved to take it much easier and give the legs and body a bit of a break. They had looked after me well the previous day, now it was my turn to look after them. Somewhere between 18 and 20 hours to be back in Loudeac seemed a decent target – it would allow a considerably more relaxed pace, with time to enjoy some cafe stops along the way. I hadn’t really intended that first cafe stop to happen so soon, but within half an hour of starting out I rolled through a sleepy little town called Trevé and spied two other riders sat at tables enjoying coffee and croissants. Setting off with no coffee or breakfast had troubled me, and this was too good to pass up. I dashed inside and ordered two pain-au-chocolats and a coffee – possibly two coffees, I forget. I sat at a free table outside with a stupid grin on my face – this was exactly the sort of day I’d planned, enjoying whatever I chanced upon along the way. A few other riders obviously had the same thought as they saw me there and by the time I started out again several other tables were now full. It was 15 well spent minutes, the perfect start to the day. The riding was just as rolling as the day before – pretty much continuously up and down. Clearly another day of hill intervals lay ahead. A steady flow of headlights were passing now, already on their way back to Paris. I wondered if my front light was as blinding as theirs – I suspect it probably was. One upside of the cold was it gave no incentive to be lazy, lifting the effort a shade on the hills being about the only way I could warm myself up a little. Having breakfasted already I had intended to bounce the official food stop, but the organizers had other plans. 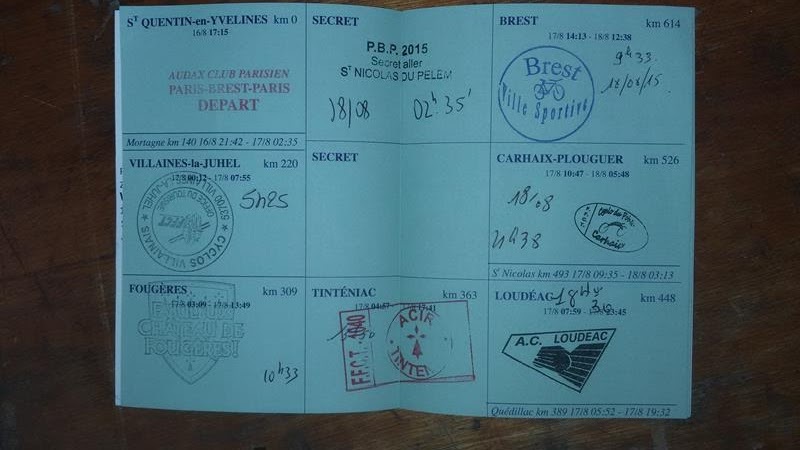 This was our first secret control – and marshals were funneled us towards bike stands and the brevet station. It was a record control for me – I was stamped, topped up, and through the control in 5 minutes. Talk about getting my faffing under control! I did spend another 7 or so minutes beside the road just beyond the town though taking a pee and donning more warm gear. Out came thin beanie, on went warm gloves, and my PBP gilet went on over the top of my jacket. It was just enough to get me vaguely warm. My legs were still freezing in just cycle shorts, but at least my feet, body, hands and head were warm. It was just about enough. Someone later told me they’d recorded a low of zero degrees in the middle of this night. I’m not sure how true that is, but the temperature was definitely very low single digits. 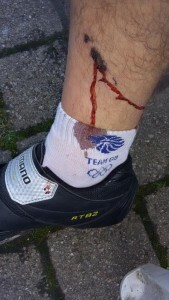 Fumbling around in the dark I made a rookie mistake and let the heavily loaded bike slip out of my hands – scoring a gash on my leg as the chain-ring gave me a nasty bite. The road took a dog-leg left and right through a small town just before the next control. As the right bend of the main street straightened out I saw a banner and flashing lights pointing up a narrow paved alley, with a board next to it advertising drinks and food. Quickly checking it was clear behind, I grabbed handfuls of brake and pulled up sharp to look down the alley. A 100m away was a brightly lit collection of benches, tables and umbrellas. With no intention of eating at the control up ahead this seemed like an ideal stop for breakfast. I guess more accurately a 2nd breakfast, but who was counting. The plan was for an easier day, meaning there was no need to rush past inviting looking little stops. I rolled up the alley, lent my bike against the wall and wandered towards the family running the stall. There was a short handwritten menu with various tarts etc but I fancied something a little bigger, so in my limited French asked if they could do me a sandwich – “avez vous baguette Jambon-Fromage?”. Instantly nodding a girl I guessed was the daughter ran inside to start making me one. With the chilly air I wasn’t remotely sleepy and so asked if they could make a “chocolat-chaud” to warm me up. They ushered me to a chair and table whilst another reached for cups and hot water. I sat there munching a deliciously fresh sandwich and sipping on the wonderfully sweet hot chocolate. Despite looking like an ordinary house this was clearly a boulangerie – an enormously welcoming one. They asked me how I was going (at least I think that’s what they said) and I did my best to reply that I was doing great, and the food and drink were lovely. I also managed to learn the name of the town (Mael-Carhaix), and that the control was only another 10km further on. Although our conversation was limited, I was stupidly pleased to have managed it entirely with my limited schoolboy French. There was really only two sad parts to this wonderful little stop: having to pack up and leave; and that more hadn’t also spotted their sign and taken the time to enjoy the warm hospitality this family had laid on at such a ridiculous hour of the morning. As I headed back down the alley I did my best to rectify this, telling the riders I saw passing what a lovely stop it was and well worth the visit. They all just looked at me blankly and rode on – their loss! Well fed and watered by the stop just before I made this another zero-faffing control – in and out in 5 minutes, despite the usual long and meandering layout which required a bit of wandering around. It was impossible to ignore that the next control was Brest, the halfway point. Once we turned around we’d start to follow signs saying “Paris“. Rolling out of Carhaix I did a quick bit of mental arithmetic – this leg was just under 90km, meaning that dawn would break somewhere around midway to the coast. With no great rush, and no real desire to ride it all in one go, I figured a stop for breakfast around 40 or 50km down the road somewhere sounded like a good idea. OK, yes, technically this would be my 3rd breakfast of the morning but once again, it was planning ahead. Taking fuel on board early would mean no need to queue for any at Brest. Including a stop, I figured I’d probably reach the control in around 5 hours – even with today’s more relaxed pace, this would still be well ahead of any timing I’d dared dream of. The first faint rays of light revealed what a stunningly beautiful landscape the unceasing hills were leading us through. We wound through the village of Huelgoat, in the dim grey light it looked stunning, an impressive looking church looming up on one side and somewhere a line of trees traversing a steep hill with a large lake down below. I made a mental note to stop on the way back when there was more light and take some photos. Soon after we swung right onto a main road – faster, and much less pleasant. It was wide enough that the speeding traffic never really bothered us, but it was soulless after the lovely lanes. One long dull rise, red tail lights of riders ahead, white headlights of returning riders coming the other way. The long drag climbed steadily up and up. A mast ahead clearly indicated the top we were aiming towards and eventually, at a crossing with another road, the climb leveled out. Very briefly we were running along the top of a high hillside, with glimpses of coastline beyond. Somewhere, down there, was Brest. Parked alongside the road and in lay-bys were numerous RVs, some with riders stopped. I was a little confused by this (and still am). Brest may have been close but we were definitely not within the last few kilometers of the control where support would be allowed. They might have been locals supported any riders needing help, but a few definitely seemed more like family or friends. I dismissed the thought – perhaps this was designated as an official area for support if parking nearer the control was limited. It would have been a rather flagrant abuse of the Audax ethos if not, but either way it didn’t really bother me. I was riding my ride, and they were riding theirs – no one else really polices our rides aside from ourselves. The sun was fully up as my wheels picked up speed and ran down a long descent to the flat coastal plain below. It was fast, fun, and still rather cold – the whole time passing a steady stream of riders slogging back up the climb. On a ride of mostly rolling hills this was something approaching a proper climb – Roc’h Trevezel. I tried to stop my mind dwelling on the thought I’d also need to climb back up it later, when it was also likely to be much warmer too. As kilometer after kilometer of fast and effortless riding whizzed by it was simply impossible not to realize that a heavy price would be exacted later for the free ride. Beyond the small hamlet of Commana came a somewhat bigger town. A large hotel on the right was filled with riders and bikes and a smaller cafe on the left was also busy but with a few spaces. Guessing there was maybe 35km to the control this was an ideal time to stop. I quickly parked up and headed inside to warm up. What a relief. The cafe was warm, there was a free chair at the bar, and although it was busy with other riders the staff were friendly and efficient. With no more than a nod in their direction I was quickly served a large and excellent cup of cafe-au-lait plus a pain-au-chocolat. I think it was a kind of breakfast special for riders – the slip said something like “formule” and showed a ridiculously small price. It was exactly what body and mind needed. I contemplated having a second, but I really didn’t need either the food or the caffeine. Reluctantly I gave up the warmth of the bar, visited the loo and headed out – donning gloves and warm gear as I left. As I pottered around I noticed the registration plate attached to a bike that was just pulling up. It had a South African flag on it – but it wasn’t a machine I recognised. Quickly scanning the name I saw it was Gerrit Visser, already on his way back I think. We exchanged hellos and quick updates on how we were going before he headed inside and I mounted up, looking forward to this final outbound stretch. We continued along a main road, now busy with morning rush hour traffic – including quite a few trucks, most of which waited patiently behind our group until it was safe to overtake. A very small number didn’t though, passing uncomfortably close and scarily fast. The same applied to cars too – the majority were extremely careful, but the few which weren’t gave real cause for concern. We were clearly on one of the main arteries to Brest and it was not particularly pleasant – in fact it was rather too reminiscent of heading into Edinburgh, the LEL turn-around point, at rush-hour. The road ahead gradually rose up, riders the other way enjoying a brief respite before the big hill which they would all know was coming. Just in front of me a guy in a red jersey on a silver coloured bike was wobbling around all over the road. I wasn’t sure if he was falling asleep or fiddling with things on his bike, but every now and then he took a sudden lurch left or right and grabbed large handfuls of bar to bring it on track. In the process he often over-corrected and veered violently to the opposite side. I really did not want to go any slower or faster, but sitting behind this guy was a recipe for disaster. If he didn’t end up in the ditch, he was under serious risk of straying into the path of one of the cars racing past. 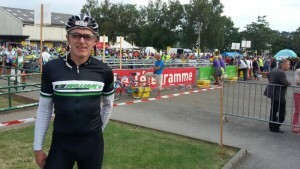 I had no choice – standing on the pedals, I urged my weary legs to push some power into the back wheel, and passed him. I knew he wouldn’t thank me, but I called to him to pay attention or take a break as I went past. I’ve no idea whether he understood or listened to me, but at least I had tried to wake him up. I was very pleased when our route left the main road at a junction a little further ahead – marshals signalling us to turn left. I clearly wasn’t paying attention here because at the time I did not notice that riders coming back were rejoining a route split here – it would have answered a question that was going to nag me on the way back. Anyhow, for now I just enjoyed the quieter lane even if it did send us some more hills to roll over. The knowledge that not far ahead was the control helped a bit, as did the lush green woods lining the hillside and folding over the top of our path. It was rather beautiful. Ever since entering Brittany we’d been passing dual language road-signs, each town having it’s Breton name in italics underneath the modern French name. It reminded me of Ireland in more ways than just that – many of the local names felt as if they shared some common linguistic root to gaelic. A few were also quite amusing, at least to me in my road weary state – Loperhet (Breton: Loperc’hed) sounded to me like “lop-her-head”, maybe an ancient site of witch beheadings! Our route took a 90 degree turn left and started to head downhill, running parallel to a main highway on our right hand side. The towers of a bridge could be seen up ahead – this was clearly the final descent into Brest. They surely weren’t going to take us onto the busy highway to get across the bridge though – maybe there was some kind of cycle-way, similar to the Humber Bridge on LEL. The approach became even more reminiscent of that section as we swung left into a park at the bottom, bollards preventing cars traveling further. But the reality which unfolded in front was far more delightful than a climb up onto a bike path. We were being taken across the old bridge, now pedestrianised and running right alongside and a little below the massive modern suspension bridge carrying the highway. 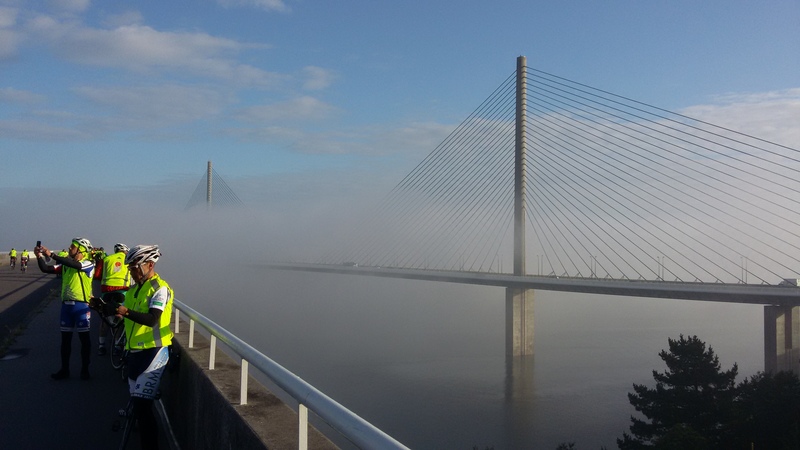 Only the tops of it’s twin towers and supporting cables were visible rising out of the thick fog bank – making it appear to be floating next to us in the morning sunlight. Like many riders around me I stopped to take photos. Once I realised where we were, I also recalled reading a forum post that we would only cross this bridge on the way into Brest. So this was going to be the only chance to capture a memory of the wonderful scene. I made sure to get a shot of me in my William’s Bike Shop shirt too. It had been my turnaround jersey in Edinburgh, and it felt especially significant to be wearing it again today. 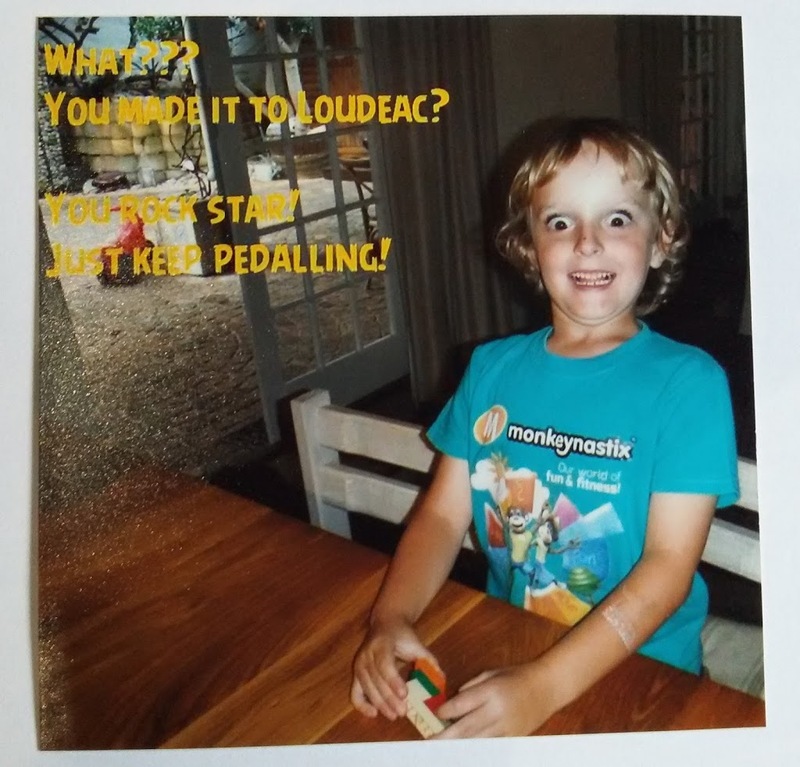 Will’s wheels were still rolling fast and true 600km into this adventure and I had absolute faith in them, despite that being a dangerous thought – the puncture and buckling fairies have a knack of hearing over-confident brainwaves. We wound through a much longer stretch of suburb and then town than I was expecting. The surface in places was quite patchy and poor – so far we’d mostly been blessed with good smooth tar. A couple of short sections had cycle lanes I seem to recall, but mainly we jostled with morning traffic on not-always wide roads. Eventually we crossed some tram tracks, and the route swung a couple more turns before marshals and a large inflatable arch finally signaled that this was it – the somewhat dreaded halfway control! I dithered around rather more than the last few controls, managing to lose 30 minutes somewhere. OK, I did fill bottles, get card stamped, put on sunscreen, and quickly phone Yoli to let her know the news. I also ate the other half of the baguette from the Mael-Carhaix stop – still fresh, but I knew it wouldn’t be enough to keep my rumbling stomach quiet for long. What I was really craving was a big bowl of Spag Bog. I was pretty sure they’d have some form of pasta at the control, but couldn’t face the idea of wasting more time queuing to find out. 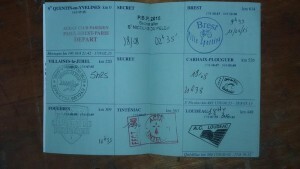 I snapped a quick picture of my now fully stamped outbound brevet card page, stashed my gear, and rolled out. It was daunting to think we had to ride every one of those kilometers again, but at least for now it was very pleasant riding. As we crossed the tram tracks again some kind of electrical interference must have upset my Garmin – a few meters on I noticed the screen was blank and it was off. At first I figured maybe the battery had died prematurely, but switching it back on again showed a full set of bars on the battery meter. It was only later that a spike from the overhead power lines struck me as a possible cause. Having checked it regularly, there didn’t seem anything else wrong.The Garmin wasn’t the only thing misbehaving. My body compass was badly thrown off by the minimal sleep over the last two and a half days. Knowing we didn’t cross the bridge again, I was expecting our route to swing right and south back, but it went the opposite way, bearing left and north through different suburbs. The roads were too busy to mess around looking down at the Garmin – plus I find having too big picture of what lies ahead distracts from the task of pedaling the stretch of road directly in front of me. So I rode on a little baffled. Baffled, getting rather too hot on the inclines, and also now needing to pee. I managed to waste another 5 minutes on a road-side stop, taking a leak and shedding layers. I also changed into my new style William’s jersey which, being closer fitting, should be considerably cooler in the what promised to a warm day of riding ahead. I really should have sorted both of these needs out in the time spent faffing at the control, but they were sorted now. A large river appeared on my right as we ran into the pretty town of Landernau, also choked with busy traffic. I cautiously weaved my way around the stationary cars, more than once nearly getting clipped by either impatient or just unobservant drivers. It was a big relief to finally hit a quiet stretch of road which swung right and across the river. It’s glaringly obvious with a map in front of me now that we’d skirted north and just re-crossed the same river that the old bridge had carried us over the estuary mouth of earlier. But my tired brain just couldn’t unravel things, it made such little sense to me that I concocted an alternate, completely ludicrous theory. Perhaps we weren’t going to go back up the big climb after all. Perhaps the RVs parked on top were actually some official support point, and only the riders with support vehicles had to go that way. I did eventually realise there was no possible way my bizarre, altered reality version could be correct. I would have read at least something about it in the pre-ride materials, and there would need to have been alternate route signage to make it work too. But all of us were now following the same, single set of very welcomed signs saying “Paris“. And then the real truth appeared to unravel the mystery – we came to that fork in the road I’d not paid proper attention to earlier. Riders still heading into Brest were being marshaled across our path and onto the quieter country lane. As the small group I was with approached we were signaled straight through, back onto the busy main road and that slight decline I’d seen homeward bound riders freewheeling down a couple of hours earlier. I spotted one other tell-tale detail which would have solved the mystery earlier – we’d been on the D764 since leaving Landernau, which was the same road number all the way back, up and over Roc’h Trevezel. I much preferred my version which magically avoided the climb that was now just a few kilometers along the road. Some rather better news did at least come my way before then. Several coincidences collided perfectly as I rolled back into Sizun. First of these was it was almost exactly midday, and here was a town with a restaurant for lunch. I spied the hotel up ahead but, as before, it looked busy. I glanced back to my right at the marquee in the hope it might be an alternative but, although people were eating inside, I couldn’t see anywhere serving food. At that point the next coincidence happened – the exact moment I looked into this corner of the town square, a large van started up and drove out of it’s parking space. Behind it was a restaurant with a single rider sitting eating, surrounded by empty tables. Clearly the van had blocked everyone’s view of this little establishment. The final coincidence landed as I hurried over – the chap was eating the most delicious looking plate of Spag Bog with a side salad. I almost pinched myself to check that I hadn’t drifted off into some idyllic dream. A quite improbable sequence of random events had delivered me to the exact plate of food I’d been lusting after and it was lunchtime. I didn’t risk disturbing such a perfectly aligned universe and pointing to the plate immediately said “la même” (the same) to a waiter nearby, foregoing his attempts to bring me a menu. He also brought some strange local variant of Coke (Breizh Cola) too – which didn’t taste half bad despite not being “the real thing“. I felt a bit of an ignoramus when I realised later that Breizh is actually the breton word for the area we were cycling through (Brittany). At least a couple of other riders arrived and eyed my plate hungrily as I relaxed and enjoyed the sublime simplicity of a plate of pasta covered in delicious meaty sauce. The short ramp into Sizun signaled the start of the slog back up to the peak ahead. It dipped a couple of times in places, but mostly it was a slow long haul for the next 15km. Being long though also meant it wasn’t especially steep. Even the final 5km that were all uphill never became a chore. Sitting there, spinning an easy gear, it was actually rather enjoyable. The slower speed gave a chance to look at the wonderful views, most of which had been lost on me earlier as I’d been focusing on the fast descent. It was a shade on the warm side though, and I was becoming quite hot and sweaty as the foot of the mast finally came into sight and I crested the top. 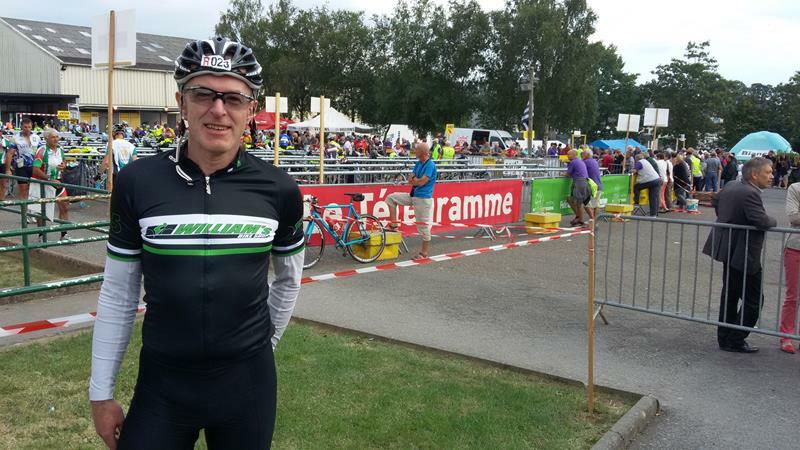 I patted myself on the back for the timely kit change – the benefit of sweating into a close fitting jersey is that it immediately starts to act like your own built in air-conditioning, and I was now cooling down nicely. You’d expect tight clothes to be unpleasant for exercise in hot weather but actually the reverse is true, providing they are made of decent material which this clearly was. My sense of direction was so badly blurred that for some reason I expected us to turn right back to Huelgoat. In fact, it was on our left – something I’m certain the signposts must have indicated but my brain ignored. Whichever side it was, we didn’t turn and I lost my chance for a photograph of the pretty hamlet. Instead the route planners kept us on the D764. 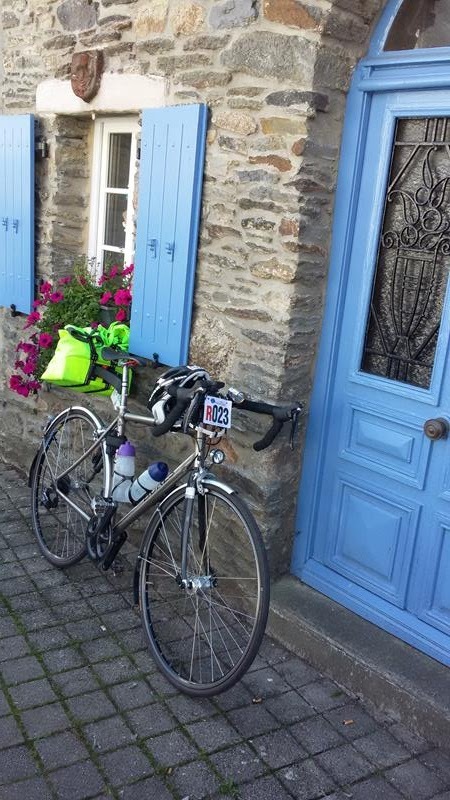 They had good intentions I’m sure – a faster, more direct and less hilly route back to Carhaix. But it was busy, the cars passing unnervingly fast, and worst of all it was dreary. I rode with an English rider along this stretch. As well as some nicely distracting conversation, he also saved at least a couple of my attempts to turn off this dismal, hot, black stretch of tar. There were no signs telling us to do so, and I’m reasonably sure my Garmin route didn’t indicate we should – it was the by-product of an over-tired brain trying to take over and lure me somewhere more pleasant. 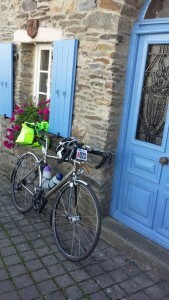 The only saving grace of the temporarily ugly route was that it transported us quickly to the Carhaix control. On the outskirts of town I’d spotted Idai, one of the EliptiGO riders I knew from LEL, and I saw him again as I was leaving the brevet station. He commented how hot the afternoon was. He was right – it had gone beyond just a warm day, the temperature had climbed into the thirties and it was becoming uncomfortable. As we parted I said something about heading for the first ice-cream I saw. It wasn’t far down the road, back in the town of Mael-Carhaix, where I spied a small local store which looked promising. A fellow rider came in as I stood in front of the freezer cabinet choosing – or rather not choosing, since I left the shop with both a Magnum and something similar to a King Cone. I forget what soda I took – I have a vague recollection of it being an Orangina. I sat on a wall in the shade of the town’s church and scoffed the lot. They tasted wonderful but it was a disastrous idea – another rookie mistake, some kind of heat induced madness. I expected to get underway and pick up speed on the way back to Loudéac, but just a few meters further on through the town a marshal ushered me right and into a secret control. I was surprised it was so close to the previous actual control, but I guess that was the point. If it surprised me, then it was a pretty good and unexpected secret. Chatting to someone after the ride (I forget who) they commented on the great food at the Mael-Carhaix control. 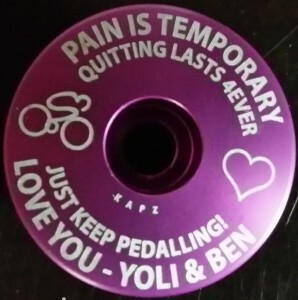 I must have missed it, or maybe they’d meant the earlier proper control but either way I rode out with no more than the required brevet stamp. If there had actually been food, and if I’d found it maybe the next grueling 70km could have been averted. Not the distance, that had to be ridden of course. But the terrible mood with which I rode it was perhaps avoidable. I forget exactly where along this stretch the slump set-in. I have a feeling it may have been a little after St-Nicholas du Pelem, now reverted to a food stop with the Paris-bound secret control already past. With no need of a brevet stamp I rode straight through and back onto the route. I may not remember the exact section where my spirits sagged, but I do vividly remember the stretch of road I was on at the time. The lane rolled down slightly and then rose up – hedges and a few trees lining both sides to the crest. 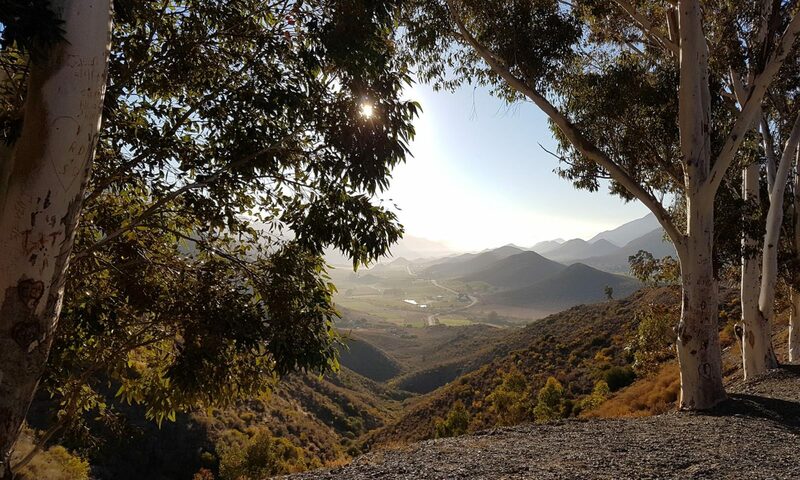 It wasn’t long or steep, in fact it was extremely gradual – but combined with over 700km of riding and limited sleep, enormous fatigue suddenly overtook me. My legs felt heavy, strength faded from them and I had no push left. I dropped onto my rear 28t cog and span incredibly slowly up the innocuous rise, other riders flashing past me. A little further on a group of young children were serving drinks and snacks to passing riders from a small table outside their cottage. I stopped and gratefully took a fill up of cold water. My eyes surveyed the table and for a moment contemplated tossing some coins into their tin for one of the cakes or some sweets. Which is when my earlier mistake struck me. Instead of taking on proper fuel I’d loaded up on sugar an hour or so back which, once used up, had caused what I was now going through. For the first time in years, I’d bonked. Realising this was both a relief and a huge downer. I knew if I kept myself well hydrated in the heat, and put some proper fuel in my body it would pass. I also knew that whatever I ate now would take several hours to kick in – meaning I was going to have to slog through it probably all the way back to Loudeac. It wasn’t likely to improve until after I got back to my hotel. Bummer! I skipped the sugary treats and rode on. Now, and roughly every 20 minutes over the next 2 hours I put in a Perpetuem Solids energy chew, in between taken the occasional mouthful of ProNutro bar. I’d much rather have sat down and eaten a proper meal, but these would deliver the right mix of carbs to kick start my engine again, which I could top off with a nice big burger before bed. It was easily the worst two and a half hours of my ride so far. The lanes and villages were still every bit as pretty but I barely noticed them – staring down at the road in front of me and grinding on. More than once I looked at the messages on my headset cap and frame sticker. I needed to remind myself that I’d get past this and that feeling grumpy and tired was not even close to a good enough reason to consider bailing. I wasn’t considering bailing, not really, but I was battling the lazy demons. Rolling back up into Trevé I passed the cafe from my 1st breakfast earlier. The energy was slowly starting to return and as if to build on that I heard a familiar voice behind me. It was Phil Whitehurst, who I knew from LEL. Both of these were well timed and gave a very welcome boost over the final ramps back to the control. We chatted as we headed into the brevet station, and back in the bike park I got Phil to snap a picture of me in the new jersey. William had given it to me just before the ride so I had to show it actually being worn! That last stretch would have been hell if I’d been riding in poor quality kit, so it’d had a more than positive effect on my ride too. My hotel bed was beckoning so I bade Phil farewell, rolled out of the control and back up the short hill towards some sanctuary. The same girl was serving at McDonalds, busier this time with a couple of cars ahead of me in the queue. I doubt she recognised me as she handed over a double helping this time – two burgers and fries. No sense taking chances and under-fueling after the misery of that last section. Back in the hotel I scoffed both burgers and one of the bags of fries and somewhere in between chatted to Yoli and Ben. It was a huge relief to get that day behind me – and even with the unwanted mental challenge I had zero reason to be unhappy. I was back in the hotel a little after 8pm, almost exactly the 20 hours I’d set as my target for the day. It hadn’t been as easy as I’d hoped, but I’d banked plenty of extra time for a decent sleep now. I set the alarm for 3.5 hours ahead, around midnight although I vaguely recall getting back up a bit later to adjust it to 00:30.